This is the eighth title in the Bryant & May series, and follows closely on the events of BRYANT & MAY ON THE LOOSE. It opens with the Peculiar Crimes Unit (PCU) still reeling from the tragic events at the end of that book and wondering about the future of their team. Before they can catch their breath, a young woman is pushed down a King's Cross escalator in a seemingly random attack. The PCU was established to deal with crimes which might undermine public confidence in the workings of society, and this murder on the Underground falls neatly into that category. With their masters at the Home Office scheming to shut them down again, the PCU is given a week to catch Mr Fox and the escalator killer. As usual with a Bryant & May, there are plenty of enjoyable excursions into the myths and legends of London. This time the focus is on the London Underground, Bryant's 'second home', and the origin of many mysteries that add flavour to the events of the novel. We learn about hauntings, strange deaths, electromagnetism and abandoned stations, along with some great background on security and surveillance on the Tube. The bizarre theorising and sideways logic of the cantankerous Arthur Bryant lead to a last-minute confrontation in the Tube. The killings are ingenious, the motive is uniquely Fowler, and the climax is exciting, unexpected, and plays on every commuter's worst nightmare. There is an enjoyable interlude in which Fowler tackles the issue of his detectives' ages. The first in the series, FULL DARK HOUSE, was set largely in 1940. Bryant and May are supposed to be old, but that old? It is hinted that the series is based on Bryant's memoirs, in turn partially based on his own imagination: "If that's not how it happened, it's how it should have happened. Far more colourful background material". If you haven't read ON THE LOOSE, you can still enjoy OFF THE RAILS, although the series is increasingly an ensemble piece, and inevitably in the course of one book the reader does not get much time to meet the peculiar characters of the Peculiar Crimes Unit in any depth. 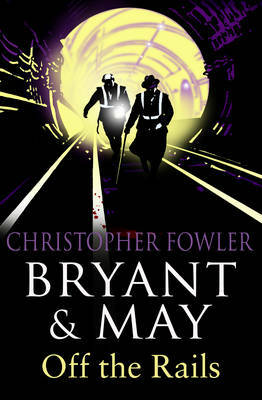 The next title, BRYANT & MAY AND THE MEMORY OF BLOOD, is also available, and Christopher Fowler's blog promises more stories from Bryant & May's younger days, as well as a graphic novel, and even a TV series pilot. Plenty to keep fans interested, as well as to tempt in new readers. Read another review of BRYANT & MAY OFF THE RAILS. Rich blogs at Past Offences.